This study has set off a fire-storm in the education community. Key thought leaders in the ed tech industry, among others, are suggesting that there are serious flaws in the methodology of the study. I agree that the study’s methodology is flawed and that the paper’s findings are, therefore, not supportable. But, I also have to question, why even target online education with a study like this in the first place? 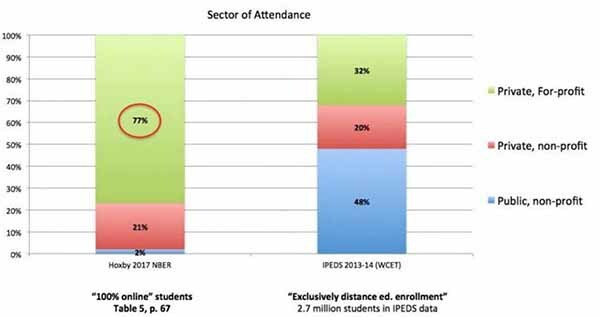 Online education is the same education students receive on campus, but it’s distributed via a different channel – online. That’s the difference. The premise of this study makes no sense. Now, there must be differences in the VALUE of education that students receive from different institutions. Of course there are. Just look, for example, at the vast cost-differences between Ivy League universities and community colleges and state universities. Clearly, students perceive that the value of an Ivy League education is higher. But admissions selectivity limits access to these institutions, leaving most students looking for other options for their higher education. And if the student can’t travel to campus, attending online opens up access. As I mentioned in my previous blog, research with online students indicates that the vast majority believe their online experience is equal to the experience they’ve had on campus. And after graduating, most believe their online program was worth their time and money. Half of students in this same study indicated that it is likely they would not be earning their degree if it were not offered online. I’d say there is pretty conclusive evidence that online students do see valuable returns from their online education. If you believe that a bachelors degree, master’s, or doctorate degree is key to your career advancement, do NOT be discouraged by studies like the one here that’s likely to grab headlines, but focuses on the wrong questions (in addition to the methodology flaws). Focus on getting all of the information you need to make the best decision for you, when it comes to selecting a university degree program. Universities are very focused on ensuring that their degree programs are excellent, regardless of how the education is distributed (on campus or online)! But it’s your job to do the due diligence work of finding the best program for you. Avoiding the mistake of not getting good returns for your investment in an online degree is pretty straight-forward. Make sure that you aren’t paying too much for your degree, whatever that magic number is. And focus on finding a program will give you the applied skills employers want to enhance your career options. Save significant amounts of time in your search for that just-right program by using the Online Degree Database to help! It is the most comprehensive and free source of information about online degree programs available in the market today. You’ll be glad you did! Visit our Available Programs page and get your free reports today!